With the release of the fourth generation Apple TV and its accompanying App Store, many apps and games now have versions available for the iPhone, iPad, iPod touch, Apple Watch and the new set-top box, often with all available as a universal app. The great thing here is that if you buy one version of the app, you get all versions without having to re-buy. That’s great for users. Unfortunately, knowing whether the apps in the iOS App Store also have Apple TV versions hasn’t always been the easiest thing in the world, but Apple has started to roll out new labels for those apps, with “Apple TV” starting to appear below “Apple Watch” in individual apps’ App Store information. 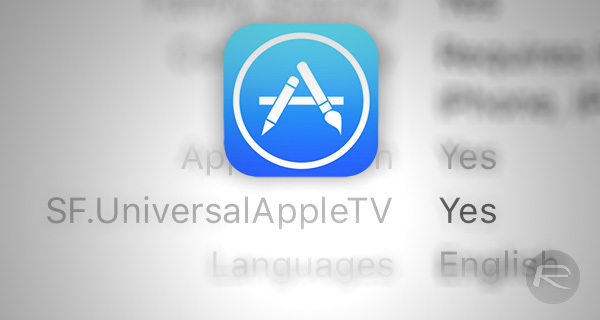 Actually, that’s not strictly true as Apple is still rolling this new label out and the text currently identifying Apple TV apps is actually “SF.UniversalAppleTV” that, it’s fairly safe to guess, won’t be around for long. Expect to start seeing that placeholder text replaced by something a little more user friendly sooner rather than later. Right now, the new identifier is only appearing on iOS devices like the iPhone and the iPad, meaning those viewing an app’s page on the desktop via either the web or iTunes will not see any mention of the Apple TV in info displayed on the left of apps’ descriptions. That too will likely change, with Apple either rolling out this new informational entry in an app’s description, or simply testing it in a more public way than it anticipated. Whether intentional or not, we now know apps that support the Apple TV will soon be more easy to spot when traversing the App Store, and that can never be a bad thing. A more visible indicator, the likes of the one shown right below an app’s title for Apple Watch support, can be expected for the Apple TV as well.